Phenylalanine hydroxylase (PAH) (EC 1.14.16.1) is an enzyme that catalyzes the hydroxylation of the aromatic side-chain of phenylalanine to generate tyrosine. 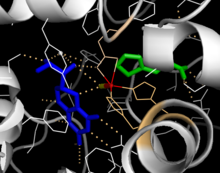 PAH is one of three members of the biopterin-dependent aromatic amino acid hydroxylases, a class of monooxygenase that uses tetrahydrobiopterin (BH4, a pteridine cofactor) and a non-heme iron for catalysis. During the reaction, molecular oxygen is heterolytically cleaved with sequential incorporation of one oxygen atom into BH4 and phenylalanine substrate. Phenylalanine hydroxylase is the rate-limiting enzyme of the metabolic pathway that degrades excess phenylalanine. Research on phenylalanine hydroxylase by Seymour Kaufman led to the discovery of tetrahydrobiopterin as a biological cofactor. The enzyme is also interesting from a human health perspective because mutations in PAH, the encoding gene, can lead to phenylketonuria, a severe metabolic disorder. formation of a Fe(II)-O-O-BH4 bridge. attack on Fe(IV)=O to hydroxylate phenylalanine substrate to tyrosine. Formation and cleavage of the iron-peroxypterin bridge. Although evidence strongly supports Fe(IV)=O as the hydroxylating intermediate, the mechanistic details underlying the formation of the Fe(II)-O-O-BH4 bridge prior to heterolytic cleavage remain controversial. Two pathways have been proposed based on models that differ in the proximity of the iron to the pterin cofactor and the number of water molecules assumed to be iron-coordinated during catalysis. According to one model, an iron dioxygen complex is initially formed and stabilized as a resonance hybrid of Fe2+O2 and Fe3+O2−. The activated O2 then attacks BH4, forming a transition state characterized by charge separation between the electron-deficient pterin ring and the electron-rich dioxygen species. The Fe(II)-O-O-BH4 bridge is subsequently formed. On the other hand, formation of this bridge has been modeled assuming that BH4 is located in iron's first coordination shell and that the iron is not coordinated to any water molecules. This model predicts a different mechanism involving a pterin radical and superoxide as critical intermediates. Once formed, the Fe(II)-O-O-BH4 bridge is broken through heterolytic cleavage of the O-O bond to Fe(IV)=O and 4a-hydroxytetrahydrobiopterin; thus, molecular oxygen is the source of both oxygen atoms used to hydroxylate the pterin ring and phenylalanine. Hydroxylation of phenylalanine by ferryl oxo intermediate. Because the mechanism involves a Fe(IV)=O (as opposed to a peroxypterin) hydroxylating intermediate, oxidation of the BH4 cofactor and hydroxylation of phenylalanine can be decoupled, resulting in unproductive consumption of BH4 and formation of H2O2. When productive, though, the Fe(IV)=O intermediate is added to phenylalanine in an electrophilic aromatic substitution reaction that reduces iron from the ferryl to the ferrous state. Although initially an arene oxide or radical intermediate was proposed, analyses of the related tryptophan and tyrosine hydroxylases have suggested that the reaction instead proceeds through a cationic intermediate that requires Fe(IV)=O to be coordinated to a water ligand rather than a hydroxo group. This cationic intermediate subsequently undergoes a 1,2-hydride NIH shift, yielding a dienone intermediate that then tautomerizes to form the tyrosine product. The pterin cofactor is regenerated by hydration of the carbinolamine product of PAH to quinonoid dihydrobiopterin (qBH2), which is then reduced to BH4. PAH is proposed to use the morpheein model of allosteric regulation. Mammalian PAH exists in an equilibrium consisting of tetramers of two distinct architectures, with one or more dimeric forms as part of the equilibrium. This behavior is consistent with a dissociative allosteric mechanism. Many studies suggest that mammalian PAH shows behavior comparable to porphobilinogen synthase (PBGS), wherein a variety of factors such as pH and ligand binding are reported to affect enzyme activity and protein stability. 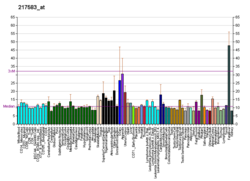 The PAH monomer (51.9 kDa) consists of three distinct domains: a regulatory N-terminal domain (residues 1-117) that contains a Phe-binding ACT subdomain, the catalytic domain (residues 118-427), and a C-terminal domain (residues 428-453) responsible for oligomerization of identical monomers. Extensive crystallographic analysis has been performed, especially on the pterin- and iron-coordinated catalytic domain to examine the active site. The structure of the N-terminal regulatory domain has also been determined, and together with the solved structure of the homologous tyrosine hydroxylase C-terminal tetramerization domain, a structural model of tetrameric PAH was proposed. Using X-ray crystallography, the structure of full-length rat PAH was determined experimentally and showed the auto-inhibited, or resting-state form of the enzyme. The resting-state form (RS-PAH) is architecturally distinct from the activated form (A-PAH). A full-length structure of A-PAH is currently lacking, but the Phe stabilized ACT-ACT interface that is characteristic of A-PAH has been determined and a structural model of A-PAH based on SAXS analysis has been proposed. Solved crystal structures of the catalytic domain indicate that the active site consists of an open and spacious pocket lined primarily by hydrophobic residues, though three glutamic acid residues, two histidines, and a tyrosine are also present and iron-binding. Contradictory evidence exists about the coordination state of the ferrous atom and its proximity to BH4 within the active site. According to crystallographic analysis, Fe(II) is coordinated by water, His285, His290, and Glu330 (a 2-his-1-carboxylate facial triad arrangement) with octahedral geometry. Inclusion of a Phe analogue in the crystal structure changes both iron from a six- to a five-coordinated state involving a single water molecule and bidentate coordination to Glu330 and opening a site for oxygen to bind. BH4 is concomitantly shifted toward the iron atom, although the pterin cofactor remains in the second coordination sphere. On the other hand, a competing model based on NMR and molecular modeling analyses suggests that all coordinated water molecules are forced out of the active site during the catalytic cycle while BH4 becomes directly coordinated to iron. As discussed above, resolving this discrepancy will be important for determining the exact mechanism of PAH catalysis. The regulatory nature of the N-terminal domain (residues 1-117) is conferred by its structural flexibility. Hydrogen/deuterium exchanges analysis indicates that allosteric binding of Phe globally alters the conformation of PAH such that the active site is less occluded as the interface between the regulatory and catalytic domains is increasingly exposed to solvent. This observation is consistent with kinetic studies, which show an initially low rate of tyrosine formation for full-length PAH. This lag time is not observed, however, for a truncated PAH lacking the N-terminal domain or if the full-length enzyme is pre-incubated with Phe. Deletion of the N-terminal domain also eliminates the lag time while increasing the affinity for Phe by nearly two-fold; no difference is observed in the Vmax or Km for the tetrahydrobiopterin cofactor. Additional regulation is provided by Ser16; phosphorylation of this residue does not alter enzyme conformation but does reduce the concentration of Phe required for allosteric activation. This N-terminal regulatory domain is not observed in bacterial PAHs but shows considerable structural homology to the regulatory domain of phosphogylcerate dehydrogenase, an enzyme in the serine biosynthetic pathway. Prokaryotic PAH is monomeric, whereas eukaryotic PAH exists in an equilibrium between homotetrameric and homodimeric forms. The dimerization interface is composed of symmetry-related loops that link identical monomers, while the overlapping C-terminal tetramerization domain mediates the association of conformationally distinct dimers that are characterized by a different relative orientation of the catalytic and tetramerization domains (Flatmark, Erlandsen). The resulting distortion of the tetramer symmetry is evident in the differential surface area of the dimerization interfaces and distinguishes PAH from the tetramerically symmetrical tyrosine hydroxylase. A domain-swapping mechanism has been proposed to mediate formation of the tetramer from dimers, in which C-terminal alpha-helixes mutually alter their conformation around a flexible C-terminal five-residue hinge region to form a coiled-coil structure, shifting equilibrium toward the tetrameric form. Although both the homodimeric and homotetrameric forms of PAH are catalytically active, the two exhibit differential kinetics and regulation. In addition to reduced catalytic efficiency, the dimer does not display positive cooperativity toward L-Phe (which at high concentrations activates the enzyme), suggesting that L-Phe allosterically regulates PAH by influencing dimer-dimer interaction. PAH is a critical enzyme in phenylalanine metabolism and catalyzes the rate-limiting step in its complete catabolism to carbon dioxide and water. Regulation of flux through phenylalanine-associated pathways is critical in mammalian metabolism, as evidenced by the toxicity of high plasma levels of this amino acid observed in phenylketonuria (see below). The principal source of phenylalanine is ingested proteins, but relatively little of this pool is used for protein synthesis. Instead, the majority of ingested phenylalanine is catabolized through PAH to form tyrosine; addition of the hydroxyl group allows for the benzene ring to be broken in subsequent catabolic steps. Transamination to phenylpyruvate, whose metabolites are excreted in the urine, represents another pathway of phenylalanine turnover, but catabolism through PAH predominates. In humans, this enzyme is expressed both in the liver and the kidney, and there is some indication that it may be differentially regulated in these tissues. PAH is unusual among the aromatic amino acid hydroxylases for its involvement in catabolism; tyrosine and tryptophan hydroxylases, on the other hand, are primarily expressed in the central nervous system and catalyze rate-limiting steps in neurotransmitter/hormone biosynthesis. Deficiency in PAH activity due to mutations in PAH causes hyperphenylalaninemia (HPA), and when blood phenylalanine levels increase above 20 times the normal concentration, the metabolic disease phenylketonuria (PKU) results. PKU is both genotypically and phenotypically heterogeneous: Over 300 distinct pathogenic variants have been identified, the majority of which correspond to missense mutations that map to the catalytic domain. When a cohort of identified PAH mutants were expressed in recombinant systems, the enzymes displayed altered kinetic behavior and/or reduced stability, consistent with structural mapping of these mutations to both the catalytic and tetramerization domains of the enzyme. BH44 has been administered as a pharmacological treatment and has been shown to reduce blood levels of phenylalanine for a segment of PKU patients whose genotypes lead to some residual PAH activity but have no defect in BH44 synthesis or regeneration. Follow-up studies suggest that in the case of certain PAH mutants, excess BH44 acts as a pharmacological chaperone to stabilize mutant enzymes with disrupted tetramer assembly and increased sensitivity to proteolytic cleavage and aggregation. Mutations that have been identified in the PAH locus are documented at the Phenylalanine Hydroxylase Locus Knowledgbase (PAHdb, http://www.pahdb.mcgill.ca/). Since phenylketonuria can cause irreversible damage, it is imperative that deficiencies in the Phenylalanine Hydroxylase are determined early on in development. Originally, this was done using a bacterial inhibition assay known as the Guthrie Test. Now, PKU is part of newborn screening in many countries, and elevated phenylalanine levels are identified shortly after birth by measurement with tandem mass spectrometry. Placing the individual on a low phenylalanine, high tyrosine diet can help prevent any long-term damage to their development. tyrosine hydroxylase (EC number 1.14.16.2), which controls levels of dopamine, epinephrine, and norepinephrine in the brain and the adrenal medulla. The three enzymes are homologous, that is, are thought to have evolved from the same ancient hydroxylase. ^ Fitzpatrick PF (1999). "Tetrahydropterin-dependent amino acid hydroxylases". Annual Review of Biochemistry. 68: 355–81. doi:10.1146/annurev.biochem.68.1.355. PMID 10872454. ^ Kaufman S (February 1958). "A new cofactor required for the enzymatic conversion of phenylalanine to tyrosine". The Journal of Biological Chemistry. 230 (2): 931–9. PMID 13525410. ^ a b c d e f Fitzpatrick PF (December 2003). "Mechanism of aromatic amino acid hydroxylation". Biochemistry. 42 (48): 14083–91. doi:10.1021/bi035656u. PMC 1635487. PMID 14640675. ^ Panay AJ, Lee M, Krebs C, Bollinger JM, Fitzpatrick PF (March 2011). "Evidence for a high-spin Fe(IV) species in the catalytic cycle of a bacterial phenylalanine hydroxylase". Biochemistry. 50 (11): 1928–33. doi:10.1021/bi1019868. PMC 3059337. PMID 21261288. ^ Bassan A, Blomberg MR, Siegbahn PE (January 2003). "Mechanism of dioxygen cleavage in tetrahydrobiopterin-dependent amino acid hydroxylases". Chemistry. 9 (1): 106–15. doi:10.1002/chem.200390006. PMID 12506369. ^ Olsson E, Martinez A, Teigen K, Jensen VR (March 2011). "Formation of the iron-oxo hydroxylating species in the catalytic cycle of aromatic amino acid hydroxylases". Chemistry. 17 (13): 3746–58. doi:10.1002/chem.201002910. PMID 21351297. ^ Bassan A, Blomberg MR, Siegbahn PE (September 2003). "Mechanism of aromatic hydroxylation by an activated FeIV=O core in tetrahydrobiopterin-dependent hydroxylases". Chemistry. 9 (17): 4055–67. doi:10.1002/chem.200304768. PMID 12953191. ^ Pavon JA, Fitzpatrick PF (September 2006). "Insights into the catalytic mechanisms of phenylalanine and tryptophan hydroxylase from kinetic isotope effects on aromatic hydroxylation". Biochemistry. 45 (36): 11030–7. doi:10.1021/bi0607554. PMC 1945167. PMID 16953590. ^ a b c d e f g h i j Flatmark T, Stevens RC (August 1999). "Structural Insight into the Aromatic Amino Acid Hydroxylases and Their Disease-Related Mutant Forms". Chemical Reviews. 99 (8): 2137–2160. doi:10.1021/cr980450y. PMID 11849022. ^ a b c Jaffe EK, Stith L, Lawrence SH, Andrake M, Dunbrack RL (February 2013). "A new model for allosteric regulation of phenylalanine hydroxylase: implications for disease and therapeutics". Archives of Biochemistry and Biophysics. 530 (2): 73–82. doi:10.1016/j.abb.2012.12.017. PMC 3580015. PMID 23296088. ^ Arturo EC, Gupta K, Héroux A, Stith L, Cross PJ, Parker EJ, Loll PJ, Jaffe EK (March 2016). "First structure of full-length mammalian phenylalanine hydroxylase reveals the architecture of an autoinhibited tetramer". Proceedings of the National Academy of Sciences of the United States of America. 113 (9): 2394–9. doi:10.1073/pnas.1516967113. PMC 4780608. PMID 26884182. ^ Jaffe EK (August 2017). 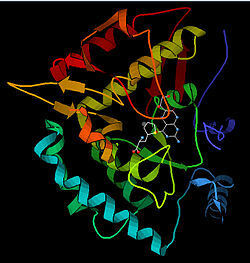 "New protein structures provide an updated understanding of phenylketonuria". Molecular Genetics and Metabolism. 121 (4): 289–296. doi:10.1016/j.ymgme.2017.06.005. PMC 5549558. PMID 28645531. ^ Patel D, Kopec J, Fitzpatrick F, McCorvie TJ, Yue WW (April 2016). "Structural basis for ligand-dependent dimerization of phenylalanine hydroxylase regulatory domain". Scientific Reports. 6 (1): 23748. doi:10.1038/srep23748. PMC 4822156. PMID 27049649. ^ Meisburger SP, Taylor AB, Khan CA, Zhang S, Fitzpatrick PF, Ando N (May 2016). "Domain Movements upon Activation of Phenylalanine Hydroxylase Characterized by Crystallography and Chromatography-Coupled Small-Angle X-ray Scattering". Journal of the American Chemical Society. 138 (20): 6506–16. doi:10.1021/jacs.6b01563. PMC 4896396. PMID 27145334. ^ a b Erlandsen H, Fusetti F, Martinez A, Hough E, Flatmark T, Stevens RC (December 1997). "Crystal structure of the catalytic domain of human phenylalanine hydroxylase reveals the structural basis for phenylketonuria". Nature Structural Biology. 4 (12): 995–1000. doi:10.1038/nsb1297-995. PMID 9406548. ^ Andersen OA, Flatmark T, Hough E (July 2002). "Crystal structure of the ternary complex of the catalytic domain of human phenylalanine hydroxylase with tetrahydrobiopterin and 3-(2-thienyl)-L-alanine, and its implications for the mechanism of catalysis and substrate activation". Journal of Molecular Biology. 320 (5): 1095–108. doi:10.1016/S0022-2836(02)00560-0. PMID 12126628. ^ Teigen K, Frøystein NA, Martínez A (December 1999). "The structural basis of the recognition of phenylalanine and pterin cofactors by phenylalanine hydroxylase: implications for the catalytic mechanism". Journal of Molecular Biology. 294 (3): 807–23. doi:10.1006/jmbi.1999.3288. PMID 10610798. ^ a b Li J, Dangott LJ, Fitzpatrick PF (April 2010). "Regulation of phenylalanine hydroxylase: conformational changes upon phenylalanine binding detected by hydrogen/deuterium exchange and mass spectrometry". Biochemistry. 49 (15): 3327–35. doi:10.1021/bi1001294. PMC 2855537. PMID 20307070. ^ Li J, Ilangovan U, Daubner SC, Hinck AP, Fitzpatrick PF (January 2011). "Direct evidence for a phenylalanine site in the regulatory domain of phenylalanine hydroxylase". Archives of Biochemistry and Biophysics. 505 (2): 250–5. doi:10.1016/j.abb.2010.10.009. PMC 3019263. PMID 20951114. ^ a b c Kobe B, Jennings IG, House CM, Michell BJ, Goodwill KE, Santarsiero BD, Stevens RC, Cotton RG, Kemp BE (May 1999). "Structural basis of autoregulation of phenylalanine hydroxylase". Nature Structural Biology. 6 (5): 442–8. doi:10.1038/8247. PMID 10331871. ^ Daubner SC, Hillas PJ, Fitzpatrick PF (December 1997). "Expression and characterization of the catalytic domain of human phenylalanine hydroxylase". Archives of Biochemistry and Biophysics. 348 (2): 295–302. doi:10.1006/abbi.1997.0435. PMID 9434741. ^ a b Bjørgo E, de Carvalho RM, Flatmark T (February 2001). "A comparison of kinetic and regulatory properties of the tetrameric and dimeric forms of wild-type and Thr427-->Pro mutant human phenylalanine hydroxylase: contribution of the flexible hinge region Asp425-Gln429 to the tetramerization and cooperative substrate binding". European Journal of Biochemistry. 268 (4): 997–1005. doi:10.1046/j.1432-1327.2001.01958.x. PMID 11179966. ^ a b c d Kaufman S (March 1999). "A model of human phenylalanine metabolism in normal subjects and in phenylketonuric patients". Proceedings of the National Academy of Sciences of the United States of America. 96 (6): 3160–4. doi:10.1073/pnas.96.6.3160. PMC 15912. PMID 10077654. ^ Lichter-Konecki U, Hipke CM, Konecki DS (August 1999). "Human phenylalanine hydroxylase gene expression in kidney and other nonhepatic tissues". Molecular Genetics and Metabolism. 67 (4): 308–16. doi:10.1006/mgme.1999.2880. PMID 10444341. ^ Muntau AC, Gersting SW (December 2010). "Phenylketonuria as a model for protein misfolding diseases and for the development of next generation orphan drugs for patients with inborn errors of metabolism". Journal of Inherited Metabolic Disease. 33 (6): 649–58. doi:10.1007/s10545-010-9185-4. PMID 20824346. Eisensmith RC, Woo SL (1993). "Molecular basis of phenylketonuria and related hyperphenylalaninemias: mutations and polymorphisms in the human phenylalanine hydroxylase gene". Human Mutation. 1 (1): 13–23. doi:10.1002/humu.1380010104. PMID 1301187. Konecki DS, Lichter-Konecki U (August 1991). "The phenylketonuria locus: current knowledge about alleles and mutations of the phenylalanine hydroxylase gene in various populations". Human Genetics. 87 (4): 377–88. doi:10.1007/BF00197152. PMID 1679029. Cotton RG (1991). "Heterogeneity of phenylketonuria at the clinical, protein and DNA levels". Journal of Inherited Metabolic Disease. 13 (5): 739–50. doi:10.1007/BF01799577. PMID 2246858. Erlandsen H, Fusetti F, Martinez A, Hough E, Flatmark T, Stevens RC (December 1997). "Crystal structure of the catalytic domain of human phenylalanine hydroxylase reveals the structural basis for phenylketonuria". Nature Structural Biology. 4 (12): 995–1000. doi:10.1038/nsb1297-995. PMID 9406548. Waters PJ, Parniak MA, Nowacki P, Scriver CR (1998). "In vitro expression analysis of mutations in phenylalanine hydroxylase: linking genotype to phenotype and structure to function". Human Mutation. 11 (1): 4–17. doi:10.1002/(SICI)1098-1004(1998)11:1<4::AID-HUMU2>3.0.CO;2-L. PMID 9450897. Waters PJ (April 2003). "How PAH gene mutations cause hyper-phenylalaninemia and why mechanism matters: insights from in vitro expression". Human Mutation. 21 (4): 357–69. doi:10.1002/humu.10197. PMID 12655545. 1tdw: Crystal structure of double truncated human phenylalanine hydroxylase BH4-responsive PKU mutant A313T. This page was last edited on 15 September 2018, at 04:52 (UTC).